Ballaghboy Lodge Farm offers two self-catering cabins which can be rented on a minimum 3 day, weekly or monthly basis. If you would like to hold a group retreat then the 4 guest bedrooms within the lodge can be rented which includes the use of the Great Room for discussions, break out sessions, and presentations. Meals may be arranged or catered and served in the Great Room, these details are specially created for each group. All rooms and cabins require a minimum 3 night stay. Groups up to 15 can be accommodated, with 11 people inside the lodge and an additional 4 adults in the cabins using the configurations described below. Only the self-contained cabins can be booked for an individual stay. The main house can be booked as part of a group reservation or a retreat stay only. The cabins are being updated at the moment and will be available for booking in 2019. After the renovations the cabins will look different than in the photos, and will have fresher, brighter and more modern design. 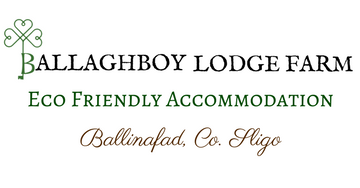 Every stay at Ballaghboy Lodge Farm includes a continental breakfast when you rent the lodge rooms, and all rooms/cabins come with linens, towels, and soap. This room is a family room, and is also the only room on the ground floor of the lodge. It comes with a full size bed and a day bed. It has a full bath (separate shower and tub). This room is a family room located on the upper level of the lodge. It comes with a full size bed and a trundle bed that can either stay as a twin size bed, or that when opened becomes two twin beds or a king size bed. It has a bathroom with a shower. This room provides two twin beds located on the upper level of the lodge. It has a bathroom with a shower. This cabin has a full size bed on the ground floor, and a loft area with restricted head height, ideal for 2-3 children. It is a self-catering cabin complete with sink, stove, fridge, and microwave. The bathroom has a shower. There is a deck for outside dining and BBQs. This cabin has two twin beds on the ground floor, and a loft area with restricted head height, ideal for 2-3 children. It is a self-catering cabin complete with sink, stove, fridge, and microwave. The bathroom has a shower. There is a deck for outside dining and BBQs.